Range-wide population declines of greater sage-grouse (Centrocercus urophasianus; sage-grouse) have been largely attributed to habitat loss and fragmentation. However, the specific conservation threats affecting the ecology of sage-grouse populations may diff er by region. 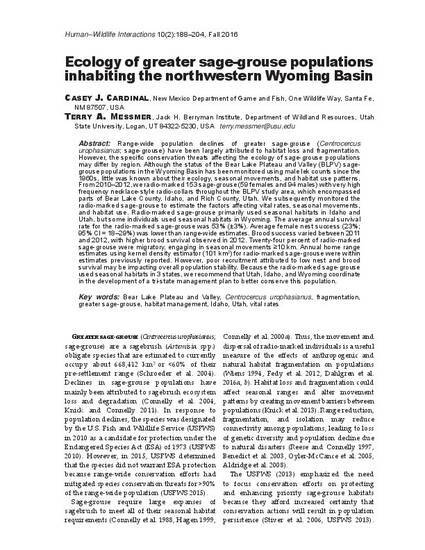 Although the status of the Bear Lake Plateau and Valley (BLPV) sagegrouse populations in the Wyoming Basin has been monitored using male lek counts since the 1960s, little was known about their ecology, seasonal movements, and habitat use patterns. From 2010–2012, we radio-marked 153 sage-grouse (59 females and 94 males) with very high frequency necklace-style radio-collars throughout the BLPV study area, which encompassed parts of Bear Lake County, Idaho, and Rich County, Utah. We subsequently monitored the radio-marked sage-grouse to estimate the factors affecting vital rates, seasonal movements, and habitat use. Radio-marked sage-grouse primarily used seasonal habitats in Idaho and Utah, but some individuals used seasonal habitats in Wyoming. The average annual survival rate for the radio-marked sage-grouse was 53% (±3%). Average female nest success (23%; 95% CI = 18–29%) was lower than range-wide estimates. Brood success varied between 2011 and 2012, with higher brood survival observed in 2012. Twenty-four percent of radio-marked sage-grouse were migratory, engaging in seasonal movements ≥10 km. Annual home range estimates using kernel density estimator (101 km2) for radio-marked sage-grouse were within estimates previously reported. However, poor recruitment attributed to low nest and brood survival may be impacting overall population stability. Because the radio-marked sage-grouse used seasonal habitats in 3 states, we recommend that Utah, Idaho, and Wyoming coordinate in the development of a tri-state management plan to better conserve this population.